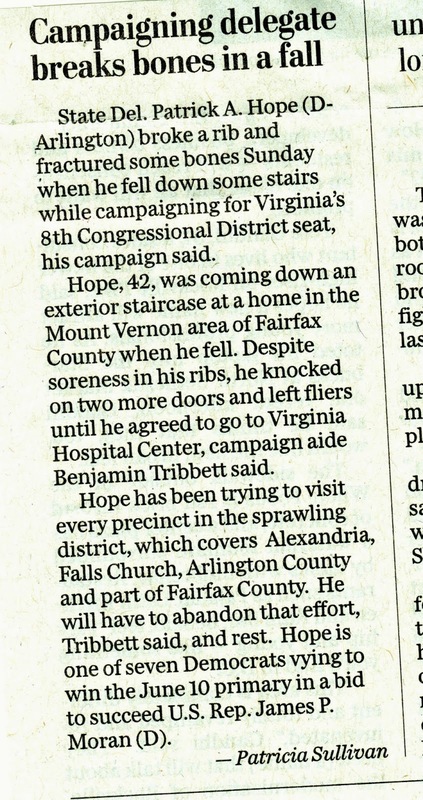 Get well wishes are due Delegate Patrick Hope (D-Arlington), who injured himself -- breaking a rib and fracturing other bones -- while campaigning for the Democratic party's congressional nomination in Virginia's Eighth District. Or should I say Virginia's "sprawling" Eighth District, as that is the unlikely adjective used by the Washington Post's Patricia Sullivan in a squib appearing in Monday's print edition. Hope has been trying to visit every precinct in the sprawling district, which covers Alexandria, Falls Church, Arlington County and part of Fairfax County. He will have to abandon that effort, Tribbett said, and will now have to wear a rib belt, take painkillers and rest. Hope is one of seven Democrats vying to win the June 10 primary in a bid to succeed U.S. Rep. James P. Moran (D). "Sprawling" is an odd word to use to describe this congressional district, which is geographically the smallest and arguably the most compact of Virginia's eleven districts. 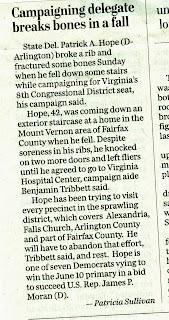 "Sprawling" more accurately describes the Fifth District, represented by Robert Hurt (R-Chatham). The Fifth stretches from the North Carolina border to the outer Northern Virginia suburbs of Fauquier County. It is often noted that the Fifth District is about the size of New Jersey. As to the Eighth? It's no wonder that Delegate Hope has been doing door-to-door retail campaigning. He's running in just about the only congressional district in Virginia where that makes sense to do. It's no wonder that Sullivan (or her editors) has omitted the word "sprawling" from a longer version of the story on the Post's web site. Alaska, Huge Ships, and DADT? On The Tonight Show tonight, Jimmy Fallon did a comedy bit involving books with odd titles or subjects. One of the books he featured was John B. Thompson's Alaska as It Used to Was, which was chosen, no doubt, for its grammatically-challenged title. Out of curiosity, I looked up Alaska as It Used to Was on Amazon.com. Nothing stood out until I scrolled down to "Customers Who Viewed This Item Also Viewed." That caught my eye because there were only two items listed, neither of which seems to have any connection to Alaska as It Used to Was, nor to each other. The two books are How to Avoid Huge Ships by John W. Trimmer and Soldier of Change: From the Closet to the Forefront of the Gay Rights Movement by Stephen Snyder-Hill. Big boats? Gay soldiers? Alaska's past? Two of these things are not like the others. In the comments section below, I will entertain suggestions about what the relationship among these three books might be. There must be some connection, but it escapes me.